Let us first understand what does the renewable sources mean?. As we know these are the sources which can be regenerated or we can say that their supply is unlimited so they are also called as inexhaustible or unlimited sources of energy because we can get energy from them for an indefinite amount of time. These sources constitutes energy from Sun, wind,rain, flowing water, from ocean waves or Earth etc. Now we can consider even wood as a source of renewable energy but to consider wood as a renewable source we have to plant lot of trees regularly and we have to take good care of them so that we can ensure that we are getting continuous Supply of wood as a source of renewable energy if we cut down trees on a regular basis it will adversely affect. If we find the energy from renewable sources let us consider the environment as the source hair the energy from this environment is either used directly or indirectly it is being converted into something useful source of energy by using some device like solar panels. So it is first converted it into some form so that we could utilize it and then it transfer to some usable form by using the device. Now you may find out that since energy is directly coming from the environment so we can say that till the environment is there like sun, wind or ocean etc. We will get this type of energy so we can say that renewable sources are not lasting source. these are limited and can not be generated hence are also called exhaustible sources of energy as ones thy are used they cannot made aagain.These sources constitutes energy from fossil fuels like petroleum, coal and natural gas. Look at the utilisation of energy from the non-renewable sources. 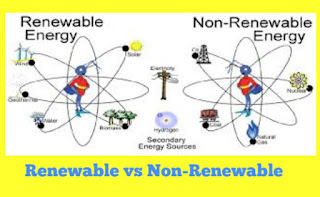 To use energy directly from non-renewable sources here, we have to convert this energy from non-renewable sources into some kind of usable form using some device or equipments to convert the energy from non-renewable sources into some usable form. Here, energy is being transferred from this non reneweable source to Justified form. After the use of energy some energy is being discarded again to the surrounding of environment. So we can say that energy is not coming back to this non-renewable source, hence we can say that once these non-renewable fuels ends completely no energy is coming back to the source. It is not being rebuilt after the use. The large use of renewable source is a risk for us in future and for that we should avoid excessive use of vehicles, deforestation etc. We hope you enjoyed Renewable and non renewable energy sources article.